Happy Blogiversary to my Heritage Happens! When I started this blog I never thought I would still be writing in it six years later, but here I am! Although finding time is tough, and I do not get to post as much as I used to, I am hoping that will be changing very soon! I have so much to share. Thank you all for following and your support! Congratulations, Cheryl! Great going and best wishes for many more successful years of blogging. 6 years is a huge accomplishment. Happy Blogiversary! Thank you Nancy, I appreciate hearing from you! Hope you are well! Thank you so much Andrea! I think I am still in shock realizing how long it has been! 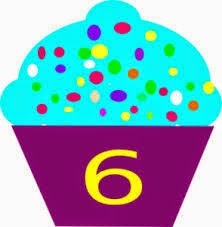 Congrats and Happy 6th Blogiversary!! Thank you Jana! I have to apologize, I accidentally deleted your comment on my phone and it deleted all the way through to the blog, my error! I really appreciate your comment! I copied the email notification and posted it here. Thanks again! Happy 6th Blogiversary, Cheryl. it's been a nice journey for the readers. I'm sure others like me enjoy reading about your family, You, and seeing your great vacation photos. There is also a nice sprinkling of genealogy as well. I remember when you wrote me and said, "I have a blog!" You were one of the early brave ones to take that step. Thanks for all your sharing.